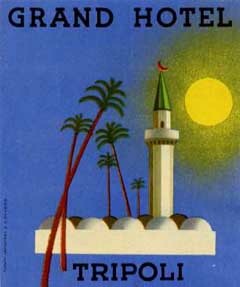 In the late 1930s, when it reached its largest extension, Italy's colonial possessions in Africa extended from Libya to the Red Sea but most of the land was desert and it is remarkable indeed that a large number of hotels was established in these regions, of which several grouped in the CIAAO chain. Often, those hotels had remarkable luggage labels, many of which show a styling similarity that makes them all the more desirable. 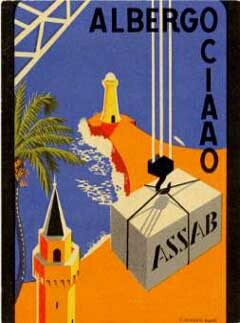 The Italian colonial empire originated in 1882 with the acquisition of Assab on the Red Sea. In 1885 the Italians occupied Massaua in Eritrea, a region until then controlled by Ethiopia. Italy's expansion southwards was cut short in 1896 when its army was crushed by the Ethiopians near Adwa. This disaster would haunt Italy for 40 years and Adwa (Adua in Italian), a minor village in Ethiopia's dry interior which was, until then, unknown to all, became a mighty symbol to every Italian. Having established a colony in Eritrea, Italy's second acquisition was Somaliland, where a small protectorate was established in 1889, soon enlarged by new acquisitions to the north and to the south. Both English and French established colonies in territories that were part of Somalia. That is the reason why the Italian possession was called "Somalia Italiana" (Italian Somaliland) to distinguish it from the adjacent territories. 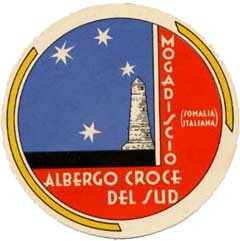 The main town in Italian Somaliland was Mogadiscio, and one of the largest local hotels was called "Southern Cross". With a slight adaptation the label at right was used until after Italian times. Italy's next endeavor in Africa came in 1911, when war was declared on Turkey on account of the possession of Tripolitania and Cyrenaica (both part of today's Libya). The territories were finally granted to Italy but for many years only Tripoli and the nearby port of Al-Khums (Homs, in Italian) were secure. The interior of the country remained largely autonomous thanks to the fierce native resistance which was only curbed in 1931 when the rebel leader was captured and executed by the Italians. Practically unknown as a hotel label printer in the homeland, Turati Lombardi & Co of Milan would, during the 1930s, count as clients most hotels in Italian Libya. Although its artist is unknown his characteristic deco style is one of the most easily recognizable of all Italian artists of the period. The label at right is one of his best designs. Since Tripoli was the most important colonial Italian town and was occupied for a considerable length of time, its most cosmopolite hotels had, not one, but a succession of labels, often superlatively designed. 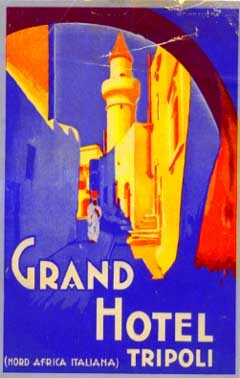 There were at least four different label designs made for the Grand Hotel in Tripoli, including the two at right (above and sideways) of which the second is, in my experience, the most rarely seen in collections. Two of the earlier labels for this hotel (not illustrated here) were designed by the artists of Richter & CO and the label at right is probably from the same source. Yet, for some reason, none of the labels bear the printer's name. On October 2, 1935 Mussolini announced to his people that as of the next day Italy and Ethiopia would be at war. Four days later the capture of Adwa was celebrated as a national vindication and on May 5, 1936, after a campaign in which poison gas was used by the Italians, Addis Ababa was taken. This campaign against a member of the League of Nations turned the democracies against Mussolini and threw Italy in the fateful path of the "Iron Pact" with the Third Reich. 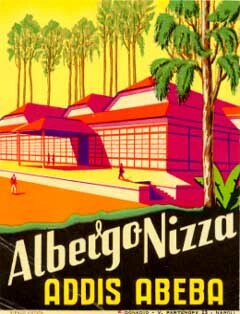 Labels of Italian hotels in Ethiopia, like the one above right for "Hotel Nice" (a French town that, by the way, had once been part of Italy and the Duce hoped to reintegrate) are particularly interesting because of the very short period of occupation of the country, during most of which Italy was already at war in Europe. 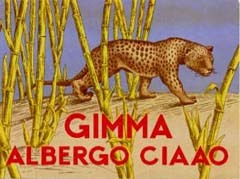 The unusual label at right, for a hotel of the CIAAO chain in Gimme (near the southern border of Ethiopia) is one of the most desirable hotel luggage labels of Italy's empire in the sands.